I think there needed to be more weapons in Minecraft aside from Swords, axes, hoes and tridents. How about wands and staves? There are no wands and staves in Minecraft. I personally don't agree with the Illusioner having a bow. How about a staff for him? Staffs are costly weapons that are expensive to use because it costs experience. It is also related with enchanting. 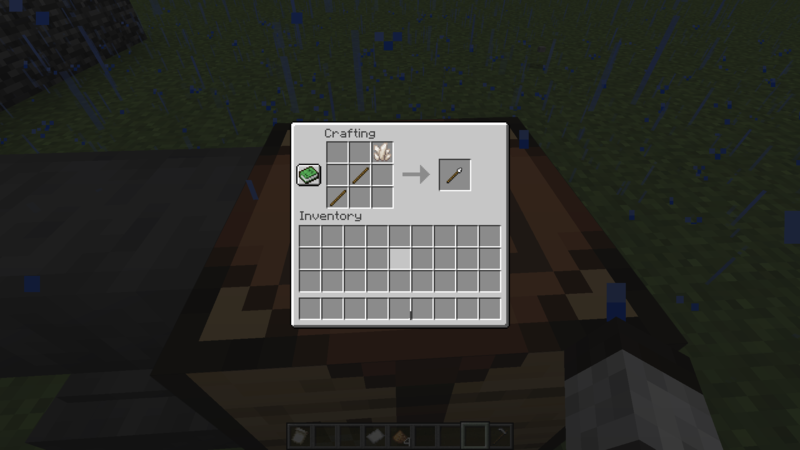 You can craft a staff using 4 sticks and a gold/iron ingot. IDK how insert screenshots here so ill describe it in text for the crafting table position. After that, you get a staff that doesn't do anything, unless if it is enchanted. You can enchant it using an enchanting table or anvil. So here are the enchantments: (also im not creative at enchantment names) Also, give me suggestions cuz i dont really know how exp works. Also, when you apply Flamethrower, or Ice Magic, or Regenerator, or Poison magic, or Death Magic to the wand, you cannot add the other enchantments mentioned before. Flamethrower - Shoot a fireball after rightclicking. Doing so will cost 15 XP. The fireball sets opponents on fire and deals 1 heart of damage when hitting an enemy. There is a 1 second pause between each attack. If you miss and hit a block, it will set it aflame. Ice Magic - shoot an ice ball. Doing so costs 15 XP. The ice ball has a chance to give an effect called Frozen which lasts for 2 seconds. (an idea of a new effect). If you are frozen, you cannot move and your vision is a bit blue. You also cannot attack or swim. If you are hit mid-air, then you instantly fall to the ground. It will be immediatly removed if you are on fire. It also deals 1 heart of damage. There is a 1 second pause between each attack. If you miss and hit a block, there will be a layer of snow above it. If you hit water, there will be ice that lasts for only 2 seconds. Poison Magic - Shoot a poisonous ball. Doing so costs 15 XP. The poison lasts for 3 seconds and its like normal poison without any amplifier. There is a 1 second pause between each attack. Regenerator - Right click and you get an effect called "Healing Aura" that lasts for 5 seconds. Doing so will cost 28 XP. Every mob and player around you gets regeneration which lasts as long as Healing Aura is on you. There is a 7 second pause between each use. Zombies and other undead mobs get harmed by this. Shulker Magic - Shoot a shulker missile that goes in a straight line. You know what it does. It costs 20 XP. Lightning Aspect - Shoot a lightning bolt in a straight line! It costs 20 XP. You can also apply unbreaking and others on the staff. Also feel free to add more suggestions to this idea. See you soon! (without having to switch between two or more pages of magic related content). But since nobody has complained so far... just carry on with this thread as it is. It seems the other thread is just catching dust... So I'll just upvote yours since I like the general idea and to give it a bit more attention. Oh as to how to insert screenshots. You can press the upload image button in the left corner (as a comment) or use the "add attachment" when editing your post. Like this for example (picture from my staff recipe as a placeholder I'm working on). (just to see how such a spell would work ingame for balance reasons etc.). Functions: Weak attack spell mainly to halt enemy movement. asset. Of course the actual spell would have its own projectile). (freeze effect... yeah I used slowness to mimic this). Hope this comes close to your idea of 'frosty' spells. Interesting idea but would need some fine tuning but I do agree Minecraft needs more magic. No, Minecraft needs less magic. Minecraft is meant to be a game about mining, about crafting, about building, about exploring, about adventuring, about doing whatever you want. Magic simply doesn't fit in Minecraft AT ALL. without sounding mean and it just came across a little harsh. said something along the line of never wanting to implement this kind of magic, no matter how well thought out the idea may be. So kind of sad for those who would like magic but good for those who don't I guess?